Time for another weekend here in Kansas City!!! Here are some ideas on what you can do this weekend! You will want to get registered here so that you and your children can create this fun Halloween magic trick. I have read that they may even give away some great gifts to the first kids who arrive! Use this coupon (click on special offers) and get one child’s admission free with each adults admission. Don’t forget that if you are a resident of Kansas City, Missouri, if you show proof of residency you get FREE admission through November! Bring the kids in their costumes and get ready to trick or treat at the zoo. The kids can enjoy the Boneville Graveyard, watch “spooky” animal shows and even get his/her photo taken. You will want to be sure that your children take part in the costume parade at 1 and/or 3 each afternoon. You can read up on the details here. Come and have some fun playing on inflatables, catching a hayride or doing the creepy cake walk! Lots of fun for the entire family. You can check out the details here. 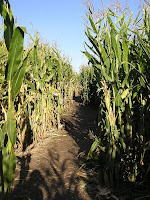 Over 9 miles of maze adventures for you to have lots of fun with the whole family. Enjoy the bridges to get a birds eye view during your outing. You can read more about the maze here. Don’t forget to check out your area pumpkin patches this weekend too! There are still plenty of pumpkins for you to find the perfect one to carve into something spooktacular! Plus, the pumpkin patch is a great place to spend the day with the family to enjoy some fresh air before winter settles in. You can save $2.00 off of your admission to Caroline’s Country Cousin’s Patch here (click on special offers). Here is a great list of Kansas City Area Pumpkin Patches (including links) courtesy of about.com. There are so many local trick or treating events around the city that I could just go on and on here. Check out your local Borders store to see if they are particiapting. You can also contact some of the churches in your area as many of them hold “trunk or treat” events this weekend as well. Whatever you decide to do, just have fun and do it as a family! So, what are your plans? Share with us!